OWU’s Eric Gnezda ’79 hosts the public television series ‘Songs at the Center,’ now being distributed nationally. Though the title will remain the same, the potential audience for the Ohio Wesleyan University faculty member’s weekly TV show will grow to encompass public television viewers across the country. “Songs at the Center” has earned national distribution from American Public Television (APT), one of the largest distributors of public television programs in the United States. APT is offering Season One of Gnezda’s show, which showcases accomplished singer-songwriters. 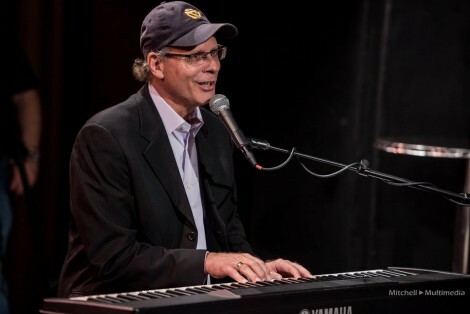 An award-winning songwriter and Emmy-nominated TV producer, Gnezda conceived the program based upon his decades of performing in venues across America, including Nashville’s iconic Bluebird Café. Each episode of “Songs at the Center” features three to four songwriters performing in front of a live audience, along with artist interviews and special features. “With national distribution ahead of us,” Gnezda says in the APT announcement, “we’re stepping up our game in Season Two. In addition to showcasing the finest regional songwriters, we’re also fortunate to be bringing our growing audience some of the top names in the business.” Among the guests who have already shot episodes are Rock and Roll Hall of Fame member John Oates, Grammy Award-winner Don Henry, and Folk/Americana legend Tom Russell. Learn more about Gnezda at http://gnezda.com. Learn more about or watch Gnezda’s “Songs at the Center” at http://songsatthecenter.com.